Why the Irumudi kettu for Sabarimala pilgrimage? Read this article to know about the Irumudi kettu or palli kettu, the items in the Irumudi kettu and the purpose. Sabarimala pilgrimage and Irumudi kettu are like inseparable twins. For a proper pilgrimage and better effect of the pilgrimage what are the items to be taken along in the Irumudi and what is the purpose of each item. Irumudi kettu is an inseparable item during the Mandala period pilgrimage to Sabarimala. What is Irumudi kettu? As the name suggests it is a bundle of 2 bundles. Iru means two, mudi means pouch and kettu means knot or bundle. 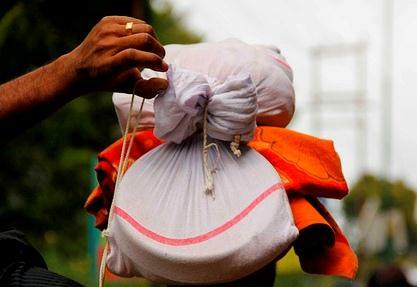 It is a two compartment bundle carried on the head by the pilgrims/devotees of Lord Ayyappan at Sabarimala. Irumudi is the travel kit of the devotee to the temple. This has to be carried only by those who observe the austerities or vratha of 41 days. Those who had the vratha with the Irumudi kettu only are allowed to proceed to the Sannidhanam (place of worship) at Sabarimala climbing the 18 padi kettu (18 steps stair). Others will have to worship by going through a side entrance. For entering through the side entrance there is no need to observe vratha and is not allowed to carry the Irumudi. The Irumudi is a specially designed bag made of usually hand woven cotton cloth with two compartments. It will be like a cotton cloth stitched to make two pouches/bags one each at the ends with a small length of the cloth in between the bags. It is more or less like the hold all used during the train journeys around 50 years back. The colour of the cloth will be black, dark blue, saffron, red or white. The two compartments are identified as the mun mudi (bag of front side) and pin mudi (bag of back side). The front portion or mun mudi is to keep the offerings and pooja articles to the deities and the back portion (pin mudi) is to keep the personal belongings of the devotee. The puja items are needed to be taken for the pilgrimage are a cleaned coconut to fill ghee; Kaaniponnu (currency coins); raw rice and jiggery; betel leaves, areca nut pieces (supari) and coins; 2 other coconuts; turmeric powder, sandal powder/paste, vibhuthi (sacred ash), Rose water, Avil (beaten – flattened rice), Malar (puffed rice), jiggery, agarbathis (incense sticks), camphor, pepper (for Vavar and the optional items like candy sugar, small quantity of honey, dry grapes, boiled raw rice and vegetables. Towels, cloths to change after bath and bed sheets for the night are also carried by the pilgrim with the Irumudi. Some of the items are optional and not carried now a days. How to use these items are explained below. First item is the Mudra thenga. Mudra means insignia and since the pilgrim is observing vrathas it is Vrath Mudra. This is a coconut the outside of which is thoroughly cleaned and all the fibers, fluff and removable particles are removed making it the bare coconut. It is supposed to be the symbol of the devotion of the pilgrim to the pilgrimage and the Lord Ayyappan. Since it is compared to the clean body of the devotee the coconut is also thoroughly cleaned to symbolize the purity of the devotee's body. The eye of the coconut which can be opened is opened and the coconut sweet water is drained out. This act (removing the sweet water) symbolizes the aspect of removing or banishing the sensual pleasures from inside the body of the pilgrim. Just as the coconut is hollow and empty now, it symbolizes that the devotee is emptied of all sensual pleasures. Now the coconut is filled with pure ghee for the abhishekam (sacred bathing) of the Lord Ayyappan. This pure ghee symbolizes the pure life force which is filling the empty mind of the pilgrim. The whole Mudra thenga is the symbol of the purified devotee. A pure person will attain the eternal bliss or the merging of the self with the ultimate Lord. That is the individual life force of the devotee will merge with the lord at death as and when it happens. The Sabarimala Sannidhanam is the only place where the Lord and the Devotee is addressed in the same terms 'Ayyappan' or 'Swami'. It is a recognition that there is no difference between the Bhagavan (Lord) and the Bhaktan (devotee – pilgrim). As the Lord is pure and the devotee through the vrathas has emptied the dirt like sensual pleasures and filled with devotion, kindness, compassion and universal love both are identical. The ghee filled in the coconut symbolising the individual life principle (life force) is submitted to wash the Lord. The individual's pure and unadulterated devotion to the lord is poured on the lord. After the Ghee is used for the abhishekam, the empty coconut is put in the burning fire outside the temple in a separate place symbolizing that as and when the pilgrim dies the life principle is merged with the Lord and the dead body is burnt by fire. After death the dead body of Hindus is invariably burnt unlike most other religions. Here the principle of 'Tat Twam Asi' meaning 'you are that' or 'you are god' of the Hindu philosophy is symbolically demonstrated to the devotee. The coins of gold, silver, copper or currency coins as per one's financial position tied in a cloth piece or small cloth bag kept along with the Mudra thenga and other items of offerings to the deities is another important item. This item of Kaaniponnu is for keeping at the feet of the idol while worshipping him at his Sannidhanam. These items are to be given to the temple authorities concerned for making payasam (a preparation of rice and jiggery cooked in proper way). These items are for the Mel Santhi of the temple for his performing the abhishekam and pooja on the devotee's behalf as a Dakshina. The turmeric powder is to be offered to the Malikapurathamma (Bhagavathi) and the Naga devathas (snake gods) in shrines on the North East side of the Lord's shrine. The mun kettu (front end of the bag) is to be opened only on climbing up to the Sannidhanam area through the pathinettu padi (18s steps). There are 2 coconuts in the pin Kettu (back end pouch). One of it is to be broken at the Pampa River. Another coconut is to offer to the Malikapurathamma (Bhagavathi). Here the coconut is not to be broken. It is to be rolled on the ground in front of the deity of the Bhagavathi. The boiled raw rice and vegetables kept was used in the earlier periods to cook the same and eat during the journey as in those days there were no stalls or facility to get food. Now things have changed and it may not be possible and practical to cook the food. So the rice is given for wanna danam (contribution for offering of free food) purpose. The sacred ash and the sandal powder is for making paste of the same separately and applying the same on the forehead, chest and upper and lower arms of the devotee. The Thulasi/Rudraksha mala (garland) worn by the pilgrim is to be removed only after returning home after the journey to Sabarimala. This removed mala is to be kept in the pooja room near the idol or photo of Lord Ayyappan. The mala has special significance as it had been in the presence of the Lord at the Sabarimala and it is believed that the presence of this in the home will ward of the bad effects of the Sani Dosha. The mala used once can be used again and again. If the same mala is used for 18 times to go on the pilgrimage it is considered as a sacred one and the place where the same is kept will have the presence of the divine forces. Similarly the irumudiketttu cloth is also sacred because it is used to carry the offerings to be made to the Lord and other deities to please them. After keeping the mala in proper place the devotee should take the bag with him for bathing and clean the same by washing thoroughly. The Irumudi so cleaned should be dried and kept folded neatly in the pooja room or a clean place. This can be used again and again. If some close relative dies, pilgrimage should not be undertaken during the time till all the rituals connected with the death is over. The period is normally 13 to 16 days. The system for each community is different. For some it may be up to 41 days. If the devotee is the person to do the rituals for the dead person, he can even perform the Bali pooja at Pampa. All the above are the system started long back when the observance of these were possible. But now the situations are different and people go for job or service outside and may not have the facility of observing the austerity measures (vratha anushatanam) at the place of work or there may some other inconveniences. In such cases people are adapting the rituals as their conscience permit. The State government along with IT mission is providing information's about Sabarimala as SMS to the devotees. Read more information to activate this service and tariff rates from here. Harivarasanam, is said to be the favourite song of Lord Ayyappa and is sung in the night before closing down of the temple after the final pooja for the day. Find the lyrics of Harivarasanam Viswamohanam in English and Malayalam here.